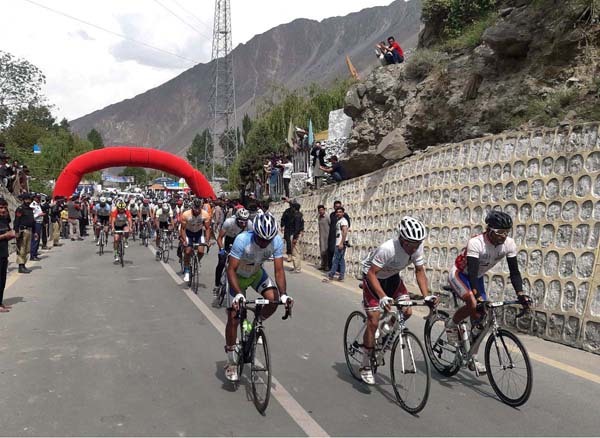 SOST (Gilgit-Baltistan), May 12 (APP)::Super-fit of Pakistan Army Abdullah came from behind crossing a last leg of 10-km in just 12 minutes creating a record of 74-kilometer per hour by winning the second stage of 110 km of the Serena International Tour de Khunjrab Road Cycle Race after leaving behind a bunch of nine cyclists with his time 3.30.06sec here Saturday. hundreds of the spectators standing on both sides of the roads received the cyclists. stage to be starting on Sunday morning from Sost to Khunjrab Pass of 84km. second stage as well with his clock time showing 3.30.26sec. hard but they made it perfectly by reaching till the finish in Sost. China have opened border for trade and tourism at Khunjrab. Shua Damman, Shua Damman” (mean welcoming, welcome). Upal and Kashgar in the north. regional culture, tradition, history and diversified cuisine practices.